Get into the habit of storing backups of the blog - REGULARLY and FREQUENTLY. Click on Download Blog and save the file. This takes hardly any time and I am planning on doing this every day - at least for now, since I am fresh out of my scary experience - plus I post daily. You can change the frequency depending on your posting schedule/frequency. 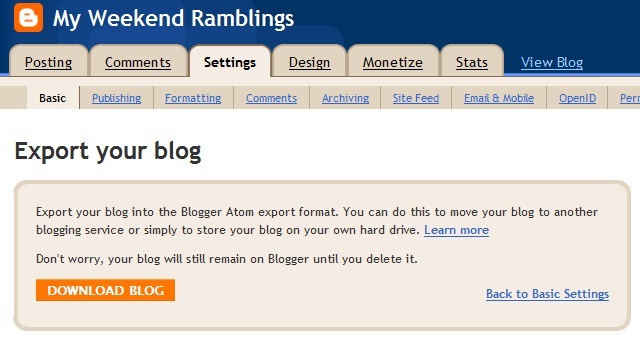 And no, you cannot do this AFTER your blog disappears! oh i didn't explored the setting > basics area! Thanks for sharing Rads...its very informative. Prerna - :) :) can try it now..
Another tip I want to add her. Always follow your blog or atleast subscribe to your own posts, that way even if you've imported a blog today, and then have though of importing next week; but within the week if the problem happens. You can get the backed up data, but what about the posts you made in the in-between period. Keeping a copy of your posts is mussssssssst!! :D I follow all my blogs he he!! he he!! :D..BTW why are u missing from IMBB? I wasn't here either naa...was out whole day for the courier work...came back by 3 I think...and then just read through posts. Appu - You absolutely must do that..you have a lot of posts on your blog, don't you? Jomol..I've read your blog...something like on the job of minding everyone's business..something like that...lol!! i am terrible at backups...! Very informative post Rads. 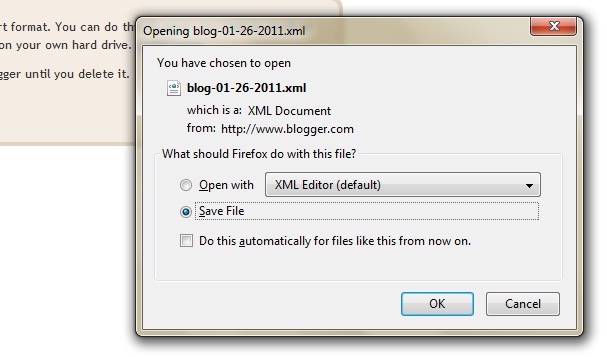 I had no idea that 'export' could be used to backup your blog. Thanks. Will do that right now! -that when you post your pics in blogs etc,there are chances people might steal it by right clicking it....so its better if you load in any flickr or some other photo upload site and use the html code. check this website for details. in other countries people who blog about family and their hobbies do follow these steps so that people dont copy ...though there are print scree and stuff available...these are few things which we we could do to avoid copying!! !